Judging from the media's attention to her every move since the November presidential election, Sarah Palin may very well rank as the most fascinating contemporary American politician this side of Barack Obama. But in the latest chapter of Sarah Watch, a minor kerfuffle has erupted in the blogosphere over whether Palin's attendance at a Washington fundraiser held on behalf of Republican House and Senate candidates Monday night (with the First Dude in tow, naturally) was a big hit or a non-event. On Sunday, Politico reported that Palin refused to attend the dinner after learning she would not have a chance to speak from the podium. National Republican Committee Chairman Pete Sessions reportedly wanted to make sure that the spotlight would not be diverted from the evening's keynoter, former House Speaker Newt Gingrich. 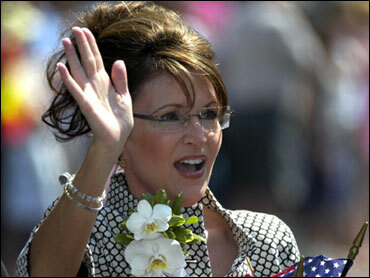 However, Palin subsequently decided on Monday to attend the event. What happened next may go down as a Rashomon moment in the annals of Palin coverage. In its writeup of the dinner, Politico described Palin's appearance pretty much as a non-event. "Palin did not speak at the event, but during a break in the program for dinner, Republicans clustered around the former vice presidential nominee's table near the front of the ballroom, eager to meet the governor and pose for pictures. t was the only table in the vast ballroom that had a crowd gathered around it -- and despite their distance from Palin's table, multiple television cameras kept their lenses trained on the governor for much of the night." Who to trust? I'll let the always-reliable Dana Milbank cast the deciding vote here. "During dinner, all the television cameras trained their lenses on Palin, her image grainy across the room. Dozens of well-wishers clustered around her table in the first row, for a chance to have a photo taken with her." But the entertainment value provided by the Fourth Estate notwithstanding, Palin has more pressing issues to consider than her treatment at the hands of the national media. As Republicans look to 2012, some GOP lawmakers already are privately trashing the prospect of a Palin presidential run as quixotic. In anonymous comments to The Hill, Palin was variously described by fellow Republicans as "a joke" and a candidate with limited appeal.